If you have been collecting Hilton Honors points conscientiously, you will have to spend them (as you should) at some point. Even though Hilton Honors no longer publish award chart changes, they just recently launched a brand new Points Explorer to help you determine the number of Hilton Honors points required for a free night. If you have elite status with the Hilton Honors program, you get 5th night free with reward nights and you should definitely take advantage of this benefit to stretch those points. Additionally, Hilton Honors members can now earn up to 4,000 bonus points per stay until 05 May 2019 with the latest Points Unlimited promotion. Click HERE to check out the Points Explorer Tool! The Points Explorer Tool enables members to check out the number of Hilton Honors Points for a free night - both the maximum standard award price as well as the lowest points price are shown. However, it is important to take note that the lowest points per night is a rate that is not always available - it is simply the lowest points per night that Hilton Honors members have booked since 12 January 2019. The Points Explorer Tool is slightly buggy at the time of writing and some of the properties do not show up even though the right city is selected. 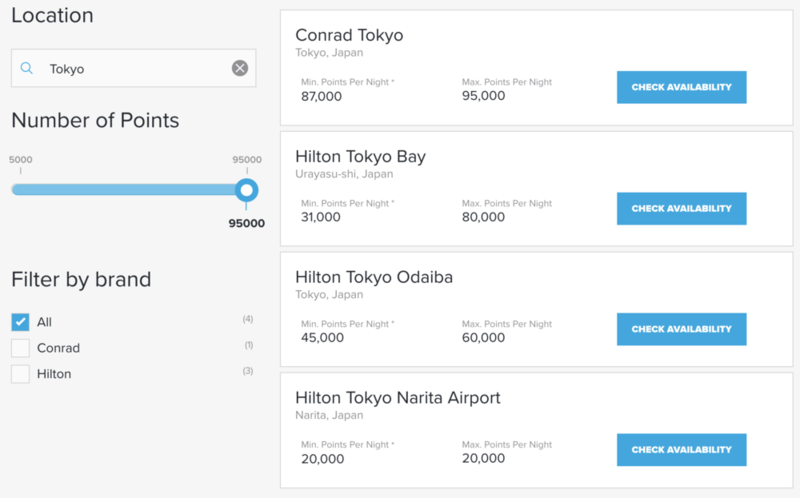 For example, in the photo above, Hilton Tokyo does not show up when Tokyo city is selected.